A seven-year legal battle rages on as mining company Pathfinder Minerals fights to recover its licences. Back in 2011 the company’s licenses were consolidated and transferred without its knowledge to Pathfinder Mozambique, which is not a subsidiary or affiliate. An English High Court ruled that Pathfinder Minerals owned the licences but this has not been recognised by the government of Mozambique. Earlier this month the Aim-listed company made its final submission to the Supreme Court and said it was confident in the application. Pathfinder Minerals is still at an exploratory stage and is not yet revenue-producing – losses reached £615,000 in 2017 amid the ongoing issues. The firm thanked shareholders for their continuing support and said, if recovered, the licence would deliver considerable value. 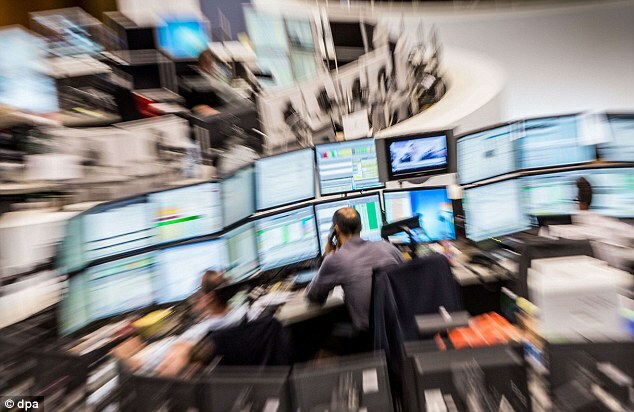 Shares plunged 14.6 per cent, or 0.18p, to 1.02p. The FTSE 100 was down 6 points on the day at 7615.63 but Mind Gym got off to a flying start on its first day of trading. The behavioural science firm, backed by an old friend of David Cameron, soared on its debut. Founder and old Etonian Octavius Black and his wife Joanne Cash were expected to make £24million when it listed yesterday – and their profits have been further boosted by a successful maiden day. The couple founded the firm with psychologist Sebastian Bailey 18 years ago. It offers psychological techniques to companies looking to change their culture, boasting blue-chip clients including GlaxoSmithKline and Unilever. 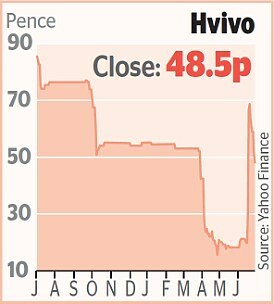 Shares in Hvivo plunged even after receiving backing from fund manager Neil Woodford. The veteran investor increased his holding to 22.5 per cent from 20 per cent after drip-feeding cash in over the past few days. But others seem less confident in the firm’s prospects – IP Group has reduced its holding to 17.1 per cent from 20.7 per cent. Hvivo is a drug discovery company researching vaccines for conditions such as Asthma. Shares dropped 4.9 per cent, or 2.5p, to 48.5p. Some 35m shares have been issued, raising £50.8million. The founders will keep 64.6 per cent of the stock. Shares floated at 146p and finished their first day up 21.5 per cent at 177.5p. Kape Technology bought CyberGhost in March last year, a privacy app for smartphones which works by scanning websites a user tries to access and letting them know if it’s safe to use or not. Yesterday security software business Kape said there had been key developments to the app, which had seen its mobile subscriber numbers double. Shares climbed 2.5 per cent, or 3p, to 122p. Meanwhile, SCISYS shares soared on a confident update. The software firm’s order book reached £100million as it added six new German broadcasters to its customer numbers. It is also bidding to be a provider in EU space programmes. Its shares rocketed 12.6 per cent, or 18p, to 160.5p. Arc Minerals was shining as it revealed more gold had been found at its site in the Congo. The project had been expected to yield 1.6m ounces – a figure that has now been revised up to 3m. Executive chairman Nick von Schirnding said it was a ‘game-changer’. Shares surged 6.3 per cent, or 0.25p, to 4.25p. Revenue at architect and interior design specialist Aukett Swanke plunged 18 per cent in the six months to March 31, it revealed. The firm recorded a loss of £1.2million, compared to a loss of £358,000 in the same period a year ago. The company blamed stagnation in the construction market and said it was relocating its UK office to lower costs. Shares plummeted 20.2 per cent, or 0.5p, to 2.1p. But shares in New Trend Lifestyle Group rocketed despite its final results being down on a year ago. The Singapore-based company specialises in Feng Shui products and services. It said sales dropped 11 per cent while UK costs had risen – it recorded a loss of £871,741 in 2017. But the firm said the first quarter of this year had shown significant improvement and it was trying to source a suitable acquisition. Shares soared 42.8 per cent, or 0.38p, to 1.25p.